Takeaway: Over the years, commercial tomato farmers have learned a few crop manipulation tricks to ensure maximum harvests from each plant. Here are six tips to help hobby growers do the same. Plant training and selective pruning are good ways to drastically increase your tomato yields. Over the past decade, plant manipulation has advanced with the introduction of plant growth monitoring and automation technologies, but a soft human touch is still required. There are a number of tricks commercial tomato farmers use throughout plants’ life cycles to maximize yields per square foot. Here are six simple strategies hobby growers can adopt to increase harvests. As a tomato plant develops, the lateral shoots (axillary buds) can rapidly explode and quickly take over the garden. Removing the lateral shoots, which occur between the stem and leaf petiole, ensures more energy is directed to the apical bud of the plant. This allows for better management of plant spacing, easier fruit harvesting, an increased amount of light and ventilation around each plant, and a longer lifespan for the crop. When axillary growth is constantly trimmed, greenhouse tomato plants can grow a staggering 30-50-ft. tall. In commercial operations, plants are trained to grow horizontally alongside the rows and then vertically up towards the roof. They are usually twisted onto strings or held with tomato clips attached to a high-strung wire. This practice must be started early on and plants are generally cultivated with two apical points trained in opposite directions. The slight bend and flex of the plant when twisting it onto a clip or string can also direct more growth hormones to the apical point and encourage faster growth. As the plant develops, greenhouse growers lower the string from above, training the plant stem horizontally alongside the row to keep the ripening fruit at an accessible height and maintain a constant canopy, so lighting and vertical space is maximized. See: How to Trellis Your Plants Properly. Your healthy tomato plant should grow new sets of compound leaves as it stretches upwards, and these new leaves are much more efficient than older leaves at converting light into chemical energy through the photosynthesis process. Depending on the height of the crop and a number of other factors, it’s good practice to remove the lower foliage (prune) and eradicate diseased leaves, but leave roughly a dozen healthy leaves on the plant. By removing the lower leaves, you encourage better airflow and a faster harvest, and the crop becomes easier to manage. As plants enter the fruiting stage, hydroponic tomatoes tend to get ambitious with their truss development. Some cherry tomato varieties can even attempt to grow more than 30 fruits per truss! By clipping the truss down to a balanced amount of fruit, according to plant type and environmental conditions, the remaining fruit will reach their maximum potential. During winter, tomato plants have less energy available to ripen, so it’s best to leave less fruit on the truss. A plant can cycle between surplus vegetative or reproductive growth according to its environmental conditions and fertilizer ratios. For a long life cycle, it’s important to maintain a proper balance so production is as consistent as possible. A higher nitrogen ratio will steer the plant towards vegetative growth. Plant morphological characteristics such as stem thickness and elongation, and the distance between the apical meristem and the last open flower, and are good indictors of plant growth status. For example, a reduction in stem thickness is a good indicator of reproductive growth and is often the result of increased environmental stress. For most tomato cultivars, a thicker stem indicates vegetative growth tendencies. Contrary to the myth that tomato plants can self-pollinate like hermaphroditic plants, they actually require motion to release the pollen from within the anther (the male organ). Generally, bees land on the flower and vibrate their wing muscles, causing the pollen to fall down onto their bellies. The more natural method of pollinating large greenhouses is using bees. However, maintaining a healthy hive requires an integrated pest management approach. There needs to be a proper balance of tomato flowers and bees. The bees pose no threat to people working in the greenhouse, but will be devastated by any insecticides used on the crop. Consequently, bumblebee pollination works well in pesticide-free greenhouses. After all the love and work put into your tomatoes, it’s time for a delicious harvest! But when is the best time to collect the fruit? 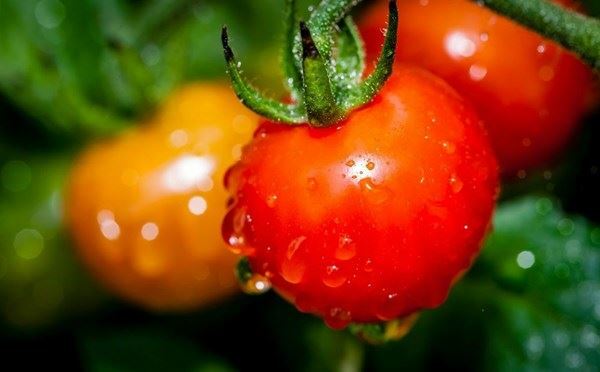 Tomatoes emit ethylene gas, which causes a reduction of chlorophyll (the green stuff) and increases the carotenoids (reds and yellows) within the fruit. This causes the flesh to soften and the fruit to change color. This also explains why tomatoes continue to ripen after they have been harvested. For personal or commercial gardens, the ideal time to harvest is when the first signs of red appear on the fruit. Harvesting at this stage gives the fruit a longer shelf life and gives you plenty of time to take a bountiful, home-grown harvest to your friends’ houses!